The recent tactical withdrawal of a giant Chinese oil rig from waters claimed by both Beijing and Hanoi does not herald a change in China’s strategy of staking out claims in large swaths of the South China Sea that have bedeviled the two ideologically communist allies over the past years. The retreat has come at a convenient juncture for the pro-Chinese faction of the Vietnamese Communist Party to preempt any planned legal action against China and thwart the highly-anticipated alliance with the U.S.
On July 15, the state-owned China National Petroleum Corporation announced that the $1 billion oil rig had finished drilling in disputed waters near the Paracel Islands, over which both Beijing and Hanoi claim sovereignty. The rig will be relocated closer to Hainan Island, China’s southernmost province, after having successfully discovered “signs of oil and gas,” the Chinese company said in a statement. The rig set off a geopolitical storm when it was deployed on May 2 into what Vietnam calls its 200-nautical-mile exclusive economic zone and continental shelf in the potentially resources- and oil-rich South China Sea. Chinese and Vietnamese ships regularly tailed one another off the waters near the rig, while anti-China protests erupted into violence in central and southern Vietnam. The resulting riots left hundreds of foreign-owned factories vandalized and four Chinese nationals dead. The rig was originally scheduled to explore the waters around the Paracels until mid-August and independent analysts have tried to account for why China withdrew it ahead of schedule, though China’s Xinhua news agency noted that July was the beginning of the typhoon season. Analysts say the move may have been prompted by the simple completion of its mission objective: to find enough hydrocarbons to justify coming back at a later time. The early arrival of two major typhoons allowed China the perfect face-saving opportunity to exit. Others argue that Beijing hopes to defuse tensions and repair its relations with Vietnam. But no matter what the reason might be, at the end of the day “the removal of the oil rig appears to be a retreat by China, although I would argue that such a retreat is tactical and at this stage does not suggest a change of China’s strategy,” according to Yun Sun, a fellow with the East Asia Program at the Washington-based Stimson Center. “By deploying the oil rig in the disputed area, China established a precedent and the “legitimacy” (at least from China’s point view) to do so again in the future. When tensions are lowered, Vietnam will have less incentive to seek legal actions or alignment with the U.S. and Japan,” she said. At the height of the tensions in mid-June, Yang Jiechi, a top Chinese diplomat who outranks the foreign minister, visited Vietnam for talks with Vietnam’s top echelons: Party chief Nguyen Phu Trong, Prime Minister Nguyen Tan Dung, and Deputy Prime Minister and Foreign Minister Pham Binh Minh. During his visit, Yang was reported to have warned Hanoi against taking legal action to challenge Beijing’s territorial claims in the South China Sea like the Philippines did in March. “Since Yang’s visit, there has been a steady de-escalation of tensions, but that has come from Hanoi, not Beijing,” said Zachary Abuza, a Washington-based Asia analyst. Analysts point out that after Yang’s visit, the Politburo, the decision-making body of the Vietnamese Communist Party, has been split into three camps. Prime Minister Nguyen Tan Dung led the confrontation camp that wanted to stand up to China, pursue a proactive foreign policy within the 10-member Association of Southeast Asian Nations (ASEAN), and elicit support from Japan, India and the U.S.. Dung has spoken out strongly in public, asserting that his country would consider taking legal action against China. He actively enlisted U.S. support to balance China’s growing assertiveness in the region. This group is looking to push for an across-the-board overhaul of the economy and the less-than-efficient state sector to gain entry into an ambitious U.S.-led regional free trade agreement, the Trans-Pacific Partnership, further deepening ties with the U.S.. “The so-called pro-American faction would feel that accommodation with China would constraint Vietnam’s freedom of action and put Vietnam into a position of subordination and dependence on China. Ideological dependency would reduce the prospects for economic reforms,” said Carl Thayer, a Vietnam expert with the University of New South Wales in Australia. Meanwhile, the group seeking accommodation with China, led by Party chief Nguyen Phu Trong, is concerned that getting too close to the U.S. would result in negative pressures or even sanctions by China. “Getting close to the U.S. would entail some response on the U.S. requirement for demonstrable progress on human rights and U.S. pressures for greater military access to Vietnam, such as Cam Ranh Bay and joint military exercises,” Thayer said. There are three heavyweights whose input could have made a difference, analysts say. Minister of Public Security Tran Dai Quang was probably fearful of mass discontent and continued protests should the conflict escalate. President Truong Tan Sang has most likely sided with the majority. Minister of Defense Phung Quang Thanh, the most senior uniformed officer to have talked about pursuing an arbitration case, is cautious about the West. Cognizant of Vietnam’s limited options, Thanh probably joined the majority. US-Vietnam Alliance: A Pipe Dream? The removal of the oil rig has resulted in the withdrawal of a Chinese armada of more than one hundred ships and vessels, setting the stage for Vietnam to withdraw its Coast Guard and Fisheries Surveillance Force ships. Thus the basis will be created for bilateral talks between China and Vietnam to discuss how to get bilateral relations back on track. But that also means “the so-called pro-China camp, or accommodationists, will resist any actions that will exacerbate relations with China. This means no legal action and no upgrade of relations with the United States. Prime Minister Dung risks being left out on a limb,” Thayer said. Right after the oil rig withdrawal, sources revealed that Dinh The Huynh, a pro-China camp member who heads the Communist Party’s Department of Propaganda and Education, instructed the media not to go further to discredit China and make it lose face because of the move. Apparently, analysts expect those advocating for a less confrontational approach to continue to carry the day. “As for future conflict with China, the accommodationist group would self-censor itself. They would veto any policy likely to arouse Chinese ire. They would in effect bandwagon with China, that is, avoid criticism of China in the expectation of Vietnam would be rewarded economically for its good behavior. In short, continued contestation between Vietnam’s pro-China and pro-U.S. factions would undermine Vietnam’s ability to pursue its national interests and stand up to Chinese pressures,” Thayer said. The analysts raise a concern: In Vietnam, there are really just one or two more meetings of the Central Committee, a powerful grouping of 175 senior Communist Party members, where some real reforms can take place before the remainder of the plenums are dominated by politicking and grooming for the next national congress in 2016. “I see a window of opportunity for pursuing bold economic reforms as closing very quickly. Once everyone is in planning mode for the Party congress, there will not be any bold reforms,” Abuza said. Teddy Pham is a Southeast Asia-based journalist. 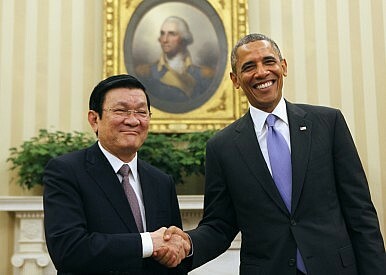 A visit to Washington by Vietnam’s general secretary this week underscores a major shift.